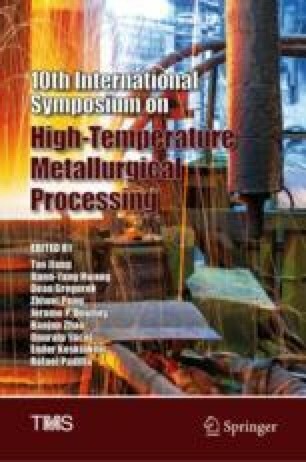 Several slag compositions of differing reactivity were designed as a potential measure for reducing erosion on submergence entry nozzle during continuous casting of high-Mn high-Al steel. Reactivities were determined according to the SiO2 content of the slag considering the reaction between [Al] and (SiO2) at the steel–slag interface. The erosion rate was evaluated by means of the rotating cylinder method; a ZrO2-C rod was immersed in the 1673 K slag sample for two hours, and the erosion rate was evaluated according to the reduction of rod diameter. The effect of slag components Na2O, Li2O, CaF2 and B2O3 on the erosion rate was investigated. The main results indicate that slag with low SiO2 content was more effective in decreasing the erosion rate than conventional high-SiO2 slag. Listed in decreasing order of intensity, the effects of the individual components on the erosion rate are Na2O, CaF2, Li2O and B2O3. The ultimate aim of the mould slag optimization effort is stabilizing the operation by extending the submergence entry nozzle service life. This work was supported by the Key Program of National Science Foundation of China (No. U1660204).